Why does fetching the data start from the 43rd byte instead of the very 1st one? How do I resolve this issue? If your traffic is always over Ethernet you can use the pinfo->dl_dst structure and copy it into a local buffer with address_to_bytes(), e.g. The offset is due to the headers provided by the other parts of the frame, i.e. the Ethernet, IP and UDP headers. Note that by passing the 4th parameter to proto_tree_add_uint() as 1 you're asking for the byte at offset 1 in your tvb, i.e. the second byte in the UDP payload. Presumably you have registered your dissector with the UDP dissector, hence the preceding items. The byte view shows the whole frame not just your application data. It's not clear to me why you expect the result to be 0x00, which byte in the byte view are you expecting to read? Thanks for the answer, I was expecting the second byte (the one beside 01, in the top left corner). I'm aware that passing the 4th parameter as 1 in proto_tree_add_uint() would get me the byte at offset 1 in the tvb, it's just that I was expecting the tvb to start from 01 (the byte at the top left corner of byte view). The offset is due to the headers provided by the other parts of the frame, i.e. the Ethernet, IP and UDP headers. Any idea on how I can set this offset to 0? The second byte you are referring to is part of the Ethernet payload, and is not part of the tvb corresponding to the UDP payload (the one that is being given to your dissector). 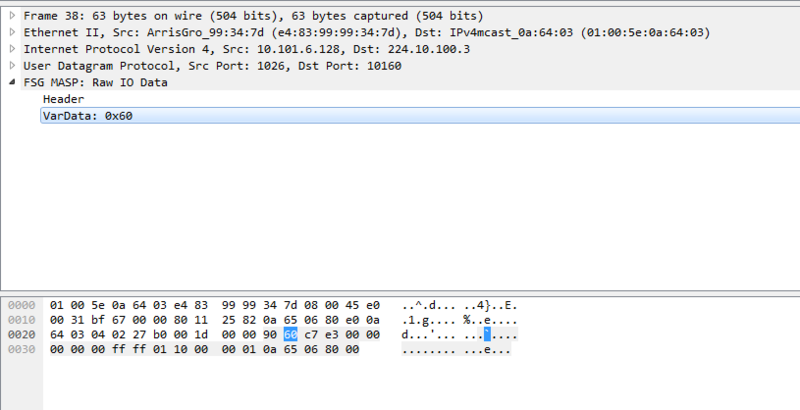 The UDP payload starts at offset 0x2a, so the second byte is 0x60 as seen in your capture. Why do you want to access the top tvb corresponding to the Ethernet frame? It's for a project. Is there a way to access the top tvb corresponding to the Ethernet frame? Do you need only the byte or will the Ethernet address do? If the latter, then the packet_info structure passed to your dissector has a member named dl_dst that holds the data link layer destination address.